Natural stone is the epitome of grace, drama, elegance and value in the home. There is nothing more durable, more natural, more impressive or more breathtaking. Each type of stone is beautifully unique and varies in color, texture and marking. The variety of types, soothing earthy colors, and unparalleled beauty make natural stone an exceptionally desirable material for kitchen countertops. Marble is a metamorphic rock formed from limestone, dolomite or serpentine by heat and pressure in the earth's crust (metamorphic rock is the result of the transformation of an existing rock type in a process called metamorphism, which means "change in form"). The metamorphic process causes a complete re-crystallization of the original rock, transforming it to an interlocking mosaic of various crystals such as calcite, aragonite and/or dolomite. Due to the existing minerals and re-crystallization patterns, marbles show up in a variety of hypnotic textures and color variations. White marble has been used for sculpture and architecture since ancient times. Michelangelo chose it for his renowned Renaissance sculptures. Classic Greeks and Romans used it in sculpture and architecture, most famously as manifestations of love. Look to the Greek sculpture of Venus de Milo depicting Aphrodite, goddess of love and beauty. The Taj Mahal (one of the Seven Wonders of the World) was erected as a symbol of the undying love felt by Mughal emperor Shah Jahan for his beloved wife, The Empress Mumtaz Mahal. Considered one of the most magnificent architectural structures in the world, the ornate mausoleum is gilded lavishly in resplendent white marble. Marble has been the look of elegance for centuries and is used today for making countertops and flooring. Marble slabs come in a wide range of colors, textures and veining; some are coarse, some finely textured; all are waterproof, heatproof and beyond beautiful. Known for its dramatic marbled coloring with characteristic swirls and veins, and for being a surface that polishes to a high gloss, marble countertops in the kitchen exemplify luxurious opulence. Marble is somewhat delicate and can scratch or stain unless professionally sealed. Also, marble is a chemical base, and if it isn’t sealed, it will stain badly if it comes in contact with any chemical acids, such as fruit juices, vinegar based liquids and certain soaps. With the proper care, your kitchen countertop is an asset that will last a lifetime. Onyx is a calcareous stone consisting with tight grain and veins runing concentrically to one another. Part of it's pleasing appearance is the high gloss achieved when polished. Onyx is translucent stone used in luxury living spaces often seen in the living spaces of the super rich. Limestone is a sedimentary rock containing at least fifty-percent calcium carbonate. Several different types of limestone exist and are differentiated based on the texture of mineral content, origin and geological age. Most limestone is arty or wholly are organic in origin and contain the hard parts or shells of mollusks and coral. Limestone is rarely polished, is suitable for internal use, and in block format may be used in external applications. Limestone's primitive textures, subtle veining, and the beautiful movements of its naturally subdued colors add serenity and elegance to kitchens, baths and flooring (It sometimes has seashells and fossils embedded in the surface). Usually found in hues of tan and gray, there are some shades found in limestone that don't exist in other natural stones such as exceptionally vibrant blues and greens. Honed limestone has the appearance of more of a matte finish. A high sheen can be accomplished with polishing. 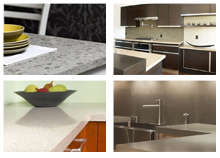 Limestone countertops vary in hardness and porosity. Some are as soft as marble and others are more scratch resistant like granite (which itself is a limestone). Stains can be removed by applying a poultice of hydrogen peroxide mixed with distilled water. As time goes on, your limestone countertops will obtain a beautiful patina. Travertine is a porous calcareous rock, formed by deposits in layered formations by hot and cold spring waters. Travertine varies i colors including white, silver-gray, yellow, red, and dark brown. Travertine is relatively easy to work with and may be honed, polished or even antiqued finished. It is primarily recommended for use in internal spaced but it can be used externally in warm climates. Today travertine is used for kitchen countertops, bathroom vanities, fireplaces and flooring. Travertine colors are warm earthy tones ranging from the softest ivories and the palest creams to rich shades of honeys, greens and deep mocha browns, with some variation from piece to piece. Travertine never appears as a solid color as veins or bands of contrasting color run throughout the stone. Being a natural stone, no two stones are alike. 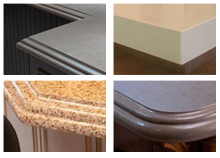 Four finishes are available for travertine countertops: polished, honed, brushed and tumbled. Polished appears as a lustrous and shiny finish; honed appears to have a smooth surface; brushed has a grainy and slightly sandy look; and tumbled appears as a more rugged and textured finish. Clean travertine counters with hot water and a sponge or clean cloth. A stone soap may also be used. Because travertine is porous, it is recommended that your countertop is kept sealed to preserve its beauty. Quartzite is very similar to granite in density and hardness and is often used in external spaces. It is suitable for internal applications. Natural beauty guaranteed...visit our online Gallery. Copyright © 2011 National Granite. | All Rights Reserved.